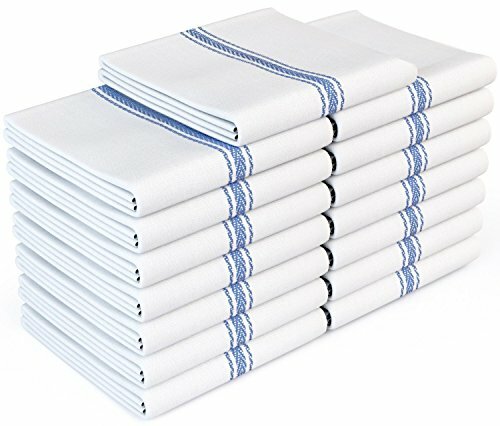 LONG-LASTING MATERIAL - These 100% Natural Cotton Dish Towels are built to last long with strong, durable fibers and won't scratch your fine silverware, plates, pots, or pans. These dish cloth sets have been through countless hours of testing so no messy job is a challenge for the Royal Classic Kitchen Towels! ULTRA ABSORBENT - With a unique Herringbone weave, these tea towels are lightweight, super absorbent and dry quickly for less risk of mildew and bacterial build-up. The Royal Classic Kitchen Towels are Lint-Free unlike other kitchen towels on the market and absorb fluids quickly and efficiently for any tasks.